A few weeks ago a friend and I were at The Walrus and The Carpenter and enjoyed a delicious zucchini salad. 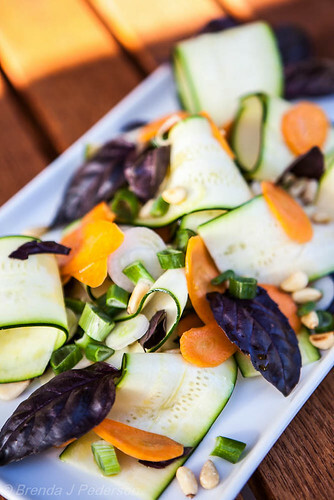 I loved how they’d made long zucchini ribbons and the salad embodied the freshness of summer vegetables. I couldn’t remember exactly what was in the salad so I created my own version. 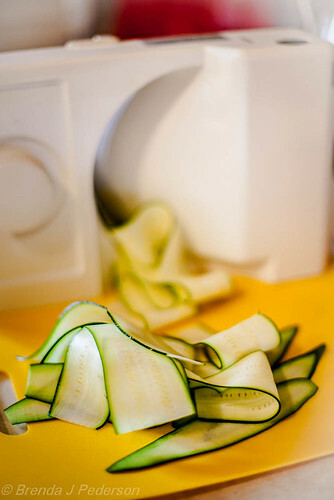 I used a slicer to make the zucchini ribbons but a mandoline would work just as well if not better! Slice the zucchini into long super thin slices. I used a slicer to do the work and had the blade set at 1mm. Slice the carrots on the diagonal a little thicker than the zucchini. Tear the basil into bite-sized pieces. I used a purple basil but any basil will work. Be a little careful when working with the zucchini. It can tear so treat it gently. Toss the zucchini with a little of the Lemon Dressing. Place on a serving plate or individual plates, slightly rolling it to make a ribbon-like presentation. Mix the carrots, onions and pine nuts . Toss with a little dressing. Sprinkle over the zucchini. Distribute the basil on the salad. Note: This salad can be a tad bit boring. Make sure you use enough dressing so that little lemon zip provides a nice spark in every bite. Next time I might also add some thinly sliced radishes for a bit more zip and even more color! wow… this looks good! I will have to attempt.